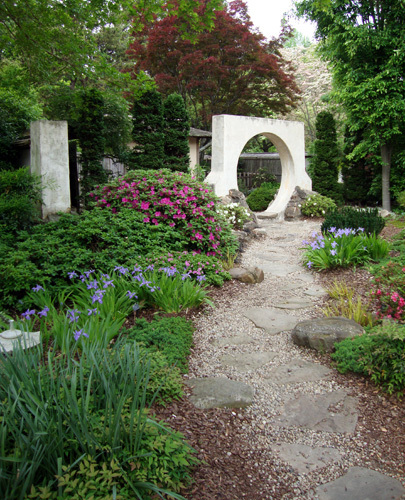 My favorite of the surprisingly few Japanese gardens in Atlanta is the one found at the Atlanta Botanical Garden, immediately identifiable by its signature Moon Gate. The Japanese Garden at the Atlanta Botanical Garden predates the Garden itself. It was started in Piedmont Park in the 1960s, even before the Atlanta Botanical Garden was chartered. The Atlanta Botanical Garden was officially founded in 1976. On the day I took this photo, less than two weeks ago, I saw Miss Georgia in the Garden. She was dressed in a black sequin dress, wearing her sash and crown! She was there for a photo shoot. It was a Monday and the Garden is closed on Mondays so she had practically the whole Garden to herself. The few other Japanese gardens I know of include one at the Carter Center and one at the Grand Hyatt Hotel in Buckhead. There is one also at the restaurant Nakato, but not it's not a Japanese Garden in the traditional sense, but fun nonetheless. There are many beautiful gardens in Atlanta...I'm glad Japanese gardens are part of our garden diversity.